With IBM Workplace Managed Client Release 2.6 on Linux, IBM offers a strategic end-to-end Linux solution that provides both the benefits of Linux and IBM Workplace Collaboration Services. 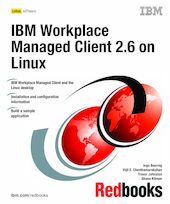 This IBM Redbooks publication provides a technical overview of IBM Workplace Managed Client and examines why it is a smart, strategic choice. In addition, we provide a detailed description and best practices for deploying, installing and configuring the product. - Benefits and positioning of a Linux client. Why Workplace Managed Client on Linux? - Overview of the product features and functionality. - Technical and architectural overview of the client. - Description of how to install the client on Red Hat Enterprise Linux and other Linux distributions. - Possibilities and benefits for an end-to-end Linux solution (IBM Workplace server and IBM Workplace Managed Client on Linux). - Example of a sample application and customization based on the underlying Eclipse framework.